Robotic systems have become a staple of many food processing applications, but when working with delicate or variable objects, many systems face difficulty. With advancements in vision and sensing technologies, robotic systems are overcoming some of their largest hurdles in food processing. Aided by five cameras and sensors to monitor resistance, a three fingered gripper designed by Lacquey, a Netherlands-based company that designs and engineers robotic grippers, is a major milestone for robotics used in food processing applications. Working with FTNON, a manufacturer of food processing equipment, Lacquey is preparing the technology for use inside large chillers where produce, such as cabbage and lettuce, is processed for packaging. 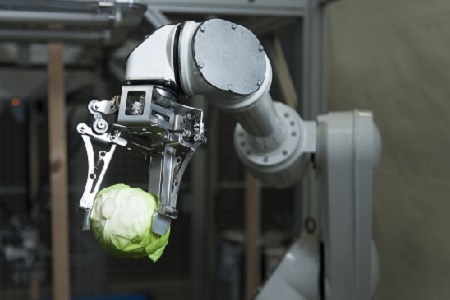 The robotic gripper is capable of picking up a piece of produce, reorienting it, and placing it into a machine that removes its core. Richard van der Linde of Lacquey explains that this is a major achievement in processing since a task such as this is currently something that can only be done by a human. The gripper is also being tested for use in other applications, such as packaging tomatoes, peppers, and mangoes. The technological advancement of a gripper that is able to be used in applications dealing with delicate and variable objects is opening to door to many new tasks that can be completed using robotics. Robotic systems have long been able to easily move and place objects that are solid, hard, and identical. However, items such as fruit, vegetables, and meat require advanced sensing and manipulation. Robotics is used throughout many industries as a method of reducing labor costs, but within the food industry, robotics also increases safety. Gary McMurray, leader of the Food Processing Technology division at the Georgia Tech Research Institute, says, “Anywhere you have people [handling food], they make mistakes from time to time.” Contaminations, such as E. coli or Listeria, are incredibly costly to food processing companies — research shows on average meat recalls erode $109 million in a company’s value within five days of a recall announcement. Implementing robotic systems that do not have the element of human error helps to avoid such costly occurrences. McMurray’s research group is working on the development of two different systems for processing poultry. The first is capable of grasping a chicken carcass that is moving along a production line and cutting the shoulder tendons to prepare for breast and wing removal. This system already matches the average yield of a human worker. The second system is a two-armed robot called Baxter that is engineered to work alongside humans and is being programmed to place poultry carcasses onto holders that will carry them through a processing line. Visual and physical feedback are key aspects of both systems’ functionality. For example, the cutting robot uses a 3D vision system that allows it to estimate the location of a chicken’s joints and tendons. From there, sensors on the knife are used to determine whether it is cutting meat or bone. Usually, in order for a robot to perform a complicated task, such as working with wet, slippery, or misshapen objects, engineers need to carefully program specific techniques and commands. However, with advanced machine-learning software, much of this process could be automated, making it more practical for robotic systems to carry out complex tasks.